The general election has ended in a hung Parliament, where no party has the 326 seats needed to get an overall majority in the House of Commons. Who is the prime minister? Theresa May remains prime minister. She plans to form a minority government, relying on the Democratic Unionist Party for support. Does this mean there will definitely be a Conservative government? If the DUP supports the Conservatives, then yes, they would together have more than the 326 seats required for a majority to pass a legislative programme. The two parties are currently in discussion, DUP leader Arlene Foster said. And the Conservatives, as the government in power before the general election, get the first attempt at forming an administration. In theory, if they fail to secure DUP backing, Labour could attempt to form its own minority government. But this is unlikely. A reminder: The magic number required for a Commons majority is 326. How does a minority government actually work? If the Conservatives go forward as a minority administration, they will fill all the ministerial positions themselves. But they will rely on the support of the DUP to help them pass legislation. Key to this is an arrangement called "confidence and supply" whereby the DUP would support the Tories if a vote of no confidence was called and help them to pass their Budget. Negotiations would still be needed to prevent ordinary day-to-day government business from being defeated. Theresa May has said her government will provide "stability" going into Brexit negotiations. And the next general election isn't due until 2022. But maintaining party unity and passing the government's bills will be a tricky task with so little room for rebellion - and the DUP are sure to make their own demands in return for propping up Mrs May's government. The BBC's Mark D'Arcy predicts a Conservative/DUP alliance faces a "long, precarious high-wire act", which will be "beset by troubles and entanglements at every turn". If the government grinds to a halt as a result, another general election could become unavoidable. Has minority government happened before? Several elections resulted in minority government in the early part of the 20th century. Governments have also started out with majorities which were then lost due to by-elections and defections. Labour had a majority of three after the 1974 general election - but this had vanished by 1977, and it stayed in power thanks to a "pact" with the Liberal Party. And John Major's Conservative government started out with a majority of 21 in 1992 but was a minority government by the 1997 general election. When will things be finalised? The first deadline is Tuesday 13 June, when the new Parliament meets for the first time. Mrs May has until this date to put together a deal to keep herself in power or resign, according to official guidance issued by the Cabinet Office. She is entitled to wait until the new Parliament to see if she has the confidence of the House of Commons. 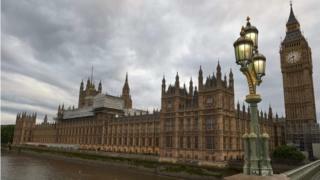 The government then needs to see if it can assemble the votes it needs to get its programme of proposed new laws passed in the Queen's Speech, which is scheduled for Monday 19 June. This is when it will be relying on the DUP's support. A coalition is when two or more parties join forces to govern as a single unit. The junior partners are given ministerial jobs and a joint programme for government is set out. This is what happened in 2010, when the Conservatives and Lib Dems teamed up, but it is unlikely this time given the numbers involved and the parties' statements. Labour has ruled one out - and in any case an alliance with the Lib Dems, SNP, Plaid Cymru and Greens would still leave it short of a majority. What will happen to the Brexit talks? The talks are currently due to begin on 19 June but if it takes a while to form a government it could ask the EU for a delay. The EU Parliament's chief negotiator said the outcome "will make already complex negotiations even more complicated". What would you like to know about the election results and what happens next? Let us know and the BBC will answer a selection.